Overview: After reading a book such as The Rainbow Fish by Marcus Pfister or The Rainbow Tulip by Pat Mora, you can create your own rainbow. Think about the many colors that make up a rainbow as you use your imagination to draw a unique picture! Cut the piece of paper in half. Using colored pencils, color the whole piece of paper with various colors so it resembles a rainbow. After the entire paper is colored with colored pencils, color over the entire paper with black crayon. You will want to press down with the crayon so it is a thick layer. It may be difficult to completely cover the colors, so don't worry if the colored pencil shows through! Now you will use the toothpick as if it were a pencil. Use it to scrape away the layer of black crayon as you create a picture. 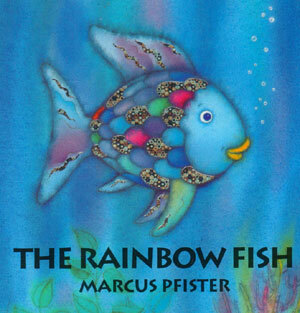 This book is about The Rainbow Fish who is “the most beautiful fish in the ocean. But he is proud and vain and none of the other fish want to be his friend - until he learns to give away some of his most prized possessions.” Children between preK and grade 3 will enjoy this book while learning the importance of sharing with others.